Ankylosis, as a medical condition, is the complete loss of movement in a joint caused by degeneration and fusion of the bony surfaces. This may result from injury, infection, or inflamation. Ankylosis in dogs may also occur as a consequence of surgical fusion of a diseased joint to correct a deformity or to alleviate persistent pain (4, 8). The forequarters, or thoracic limbs of a dog (the right and left front legs), are roughly equivalent to human arms, or the arms of any other primate that walks upright on two legs. A relatively long, triangular bone – the scapula – is attached to the side of the chest wall by muscles, ligaments and tendons; this is the canine shoulder blade. Located in proximity of the first four ribs, it is capable of great movement. It forms the shoulder joint in combination with the bone of the upper arm – the humerus – another long bone, which runs downwards and backwards, ending at the elbow joint, delineated by the radius and ulna. These two bones, firmly fused to each other both above and below, form the region of the canine forearm. Running downwards in a more or less vertical direction the radius and ulna terminate by forming the carpus or wrist joint with seven small carpal bones (4). From the carpal bones ensue five metacarpal bones. The first one is vestigial only and is referred to as the dew-claw. The other four, numbered two to five, are fully functional and conclude with the bones of the foot, termed the phalanges. The first digit has two phalanges only, while each of the other four has three (4). Thus, in addition to its necessary structural capacities (keeping the dog from falling while facilitating locomotion), this system of bones is capable of performing both generalized and highly specific movements. Ankylosis of the carpal joints can be of exceptionally negative consequence for the dog, seriously limiting standing capacities, lateral locomotion and articulated motion of smaller scale (1, 2, 7). From the human perspective, imagine if your wrist was fused in a way that prohibited rotation or bending; capability for performing many essential actions – eating, bathing, grasping, reaching, touching – would be very limited, if not entirely curtailed. 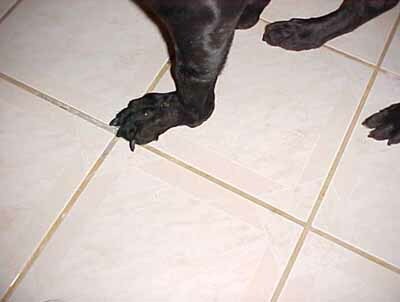 Limitations would be further debilitating if ankylosis extended to the fingers, or the metacarpels, in canine physiology. Perhaps the condition is even more crippling for a dog, since the carpels are an essential component of the canine thoracic system, and thus essential to keeping the creature walking without pain, or from falling. The complexity of the carpal articulations and the multiple bones and ligaments that form and stabilize the joint create a difficult diagnostic problem for many veterinarians. Most carpal injuries, and particularly those which go undiagnosed or untreated, increase the risk of osteoarthritis and have a potential for long-term lameness (1, 2, 4). Though dogs can develop a rudimentary form of ankylosis when young, the problem typically develops with age. Animals age faster than humans, and have different biological process. Ankylosis in dogs occurs for several reasons. A major cause is injury to the bone, joint or surrounding tissue, which can happen at any age. If an injury isn’t nursed back to health properly, the stiffness that comes with an injury will remain for an indefinite amount of time, even become painful and permanent; fractures or broken bones which don’t heal properly can initiate ankylotic conditions (4, 8). 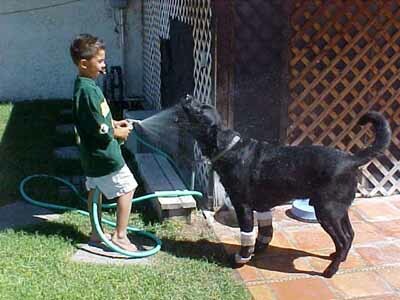 Genetics and the physical structure of certain animals also play a major role in the health of their joints. Large breed type dogs such as the German shepherd, Golden, Lab and the Great Dane have genetic predispositions to elbow and carpel problems (6). Age is also a factor. The older dogs become, the longer their joints have been responsible for carrying the weight around; cellular and biochemical transformations common to aging stresses joints, causing tension on bones, muscle tendons and ligaments (1, 2, 4, 6, 8, 9). Included are such conditions as: (1) Irregular bones edges: As dogs grow older, the ends of their bones become uneven and grow spurs, which irritate the soft tissue, tendons and ligaments around the bones. The rubbing together of these bone-edges and the bones they’re attached to, causes swelling and pain. This situation is complicated in the carpel system, consisting of many smaller bones (4, 8). (2) Bone brittleness: As dogs age, less of the substance that comprises the bone being made, resulting in the overall weakening of their bones. Fractures are not uncommon in the older animal. The stress caused by weakened bones, fractures or broken bones may cause improper healing which will further complicate joint function and potentially stimulate the onset of ankylosis (4). In addition, further conditions emerge which may generate circumstances conducive to the development of canine carpel ankylosis: (1) Loss of muscle mass: Muscle mass is necessary to help support good, healthy joints. It provides protection to the tendons and ligaments which make it possible for flexible joint movement (4, 8, 9). (2) Cartilage erosion: As an animal ages, the cartilage – soft tissue that covers the ends of bones – slowly erodes. At the same time, the body produces less to replace it. This will cause the ends of the bones to become rough (4, 8, 9). (3) Decreased production of joint fluid: There is a sack around each joint that contains synovial fluid, which protects the bones so that they don’t grind together when we move. As with diminished production of cartilage, age decreases the manufacture of this fluid causing incredibly painful friction during movement. This not only weakens the tendons, ligaments and muscles, but stresses bones, as well (1, 2, 4, 9). For sporting dogs — those who show or race — carpal disease can be career-ending, especially if resulting from undiagnosed or untreated injuries; these injuries are frequently hyperextensive-torsional in nature (7). Canines exhibiting lameness due to carpal disease that show no or minimal external signs associated with the carpus will require diagnostic, local anesthesia to identify the site of pain (4, 7, 8). Local anesthesia of the middle carpal joint and structures of the metacarpus is frequently required. When normal radiographic images of the carpus and metacarpus are obtained, the veterinarian may utilize perineural anesthesia of the lateral palmar nerve at a later time or further diagnostic imaging, such as ultrasonography of the proximal suspensory ligament or scintigraphy (4, 8). Based on the recognized disease present, therapy commonly includes rest, anti-inflammatories (including intra-synovial medications), foods rich in anti-toxins, and surgery (3, 4, 6, 8, 9). The use of arthroscopy and its importance in prognostication as well and treatment has become obvious to the majority of veterinarians and knowledgeable dog-owners. Some evidence exists that quality of synovial fluid may significantly impact canine carpel ankylosis and similar diseases of the joints. Synovium are the thin membranes which line the fibrous capsule surrounding a movable joint, such as the canine carpel. The synovium also form a sheath for tendons of the forepaw, and those connecting to the foreleg; the sheaths in question line the fibrous or bony tunnels through which tendons glide. The membrane secretes synovial fluid, a clear, sticky liquid whose purpose is to lubricate the joint or the tendon. With respect the impact of synovial fluid on carpel joints and their function, the research team of Bari, Carter, Bell, Morgan, and Bennett investigated autoimmunity to collagen in a canine population, during a study conducted in 1989. Increased levels of serum anti-native collagen type II antibody were revealed in 72% of dogs with rheumatoid arthritis (RA), 88% of dogs with infective arthritis (IA), 52% of dogs with osteoarthritis (OA), and 61% of dogs with ankylosis (AN). The mean levels of antibody in carpel disease patients were also significantly increased compared to control dogs. For AN dogs, evidence showed serum anti-collagen antibody correlated with that in precipitated serum immune complexes. There was also a correlation between anti-collagen antibody level in synovial fluid and in synovial fluid complexes in dogs with rupture of the carpel membrane. These findings implicate collagen-anti-collagen complexes in the pathogenesis of naturally occurring joint diseases in the dog, but they are unlikely to be the primary etiological mechanism (2). The results were largely corroborated seven years later when Arican, Carter and Bennett investigated the relationship between markers of bone and cartilage turnover in sera and synovial fluids in naturally occurring canine joint diseases; they noted in doing so that markers of joint disease are much sought after in human and veterinary applications. Osteocalcin (OC) was measured by radioimmunoassay; enzyme-linked immunosorbent assays were used to measure keratan sulphate, chondroitin sulphate, hyaluronan and antibodies to collagen I and II. Dimethylmethylene blue binding assay was used for the estimation of sulphated glycosaminoglycans. Compared to normal dogs significantly higher serum OC was seen in dogs with carpel ankylosis, among other conditions – osteoarthritis, rheumatoid arthritis, and rupture/stretching of cranial cruciate ligament, among them (2). Symptoms of ankylosis may be temporarily relieved by supporting the joint with a splint or cast, the use of analgesics, nonsteroidal anti-inflammatory drugs, or occasionally, an injection of corticosteroid drugs. Long-term solutions may involve repetitive surgeries to restore movement to the joint(s). However, the emergence of braces and prosthetics now provide an alternative to repetitve and costly surgeries that don’t always provide guarantees of a positive recovery. Lastly, and probably most importantly is proper nutrition and feeding a diet rich in antioxidants. Antioxidants help support the body during the natural process of aging by fighting the inevitable free radicals present that attack the body resulting in a myriad of health concerns, some of which have much to do with the joints. (1) Arican M, Carter SD, Bennett D: Osteocalcin in canine joint diseases. British Veterinary Journal, 1996; 152(4): 373-375, 411-423. (2) Bari AS, Carter SD, Bell SC, Morgan K, Bennett D: Anti-type II collagen antibody in naturally occurring canine joint diseases. British Journal of Rheumatology, 1989; 28(6): 480-486. (3) Davenport DJ, Ching RJW, Hunt JH, et al. : The effect of dietary levels of folate and cobalamin on the serum concentration of folate and cobalamin in the dog. Journalof Nutrition, 1994; 124: 2559S-2562S. 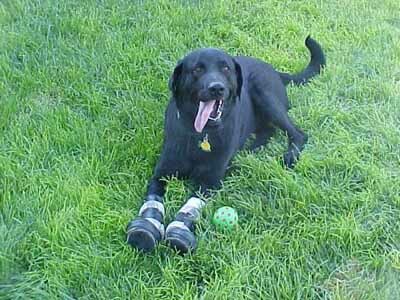 (4) Denny, HS: A guide to canine & feline orthopedic surgery. London: B. Blackwell. (5) Herron MA: Hypervitaminosis A. In: Bojrab MJ, ed., Diseasemechanisms in small animal surgery. 2nd ed. Philadelphia: Lea & Febiger, 1993: 876-878. (6) Outerbridge CA, Myers SL, Giger U: Hereditary cobalamin deficiency in border collie dogs. Journal of Veterinary Internal Medicine, 1996; 10: 169. (7) Roush, JK: Carpel injuries in sporting dogs. London: Symposium Equine and Small Animal Proceedings, 2003. (8) Schalm OW, Jain NC, Carroll EJ: Veterinary hematology, 3 rd ed. Philadelphia, Lea & Febiger, 1975. (9) Schumacher HR, Newton C, Halliwell REW: Synovial pathologic changes in spontaneous canine rheumatoid-like arthritis. Arthritis & Rheumatism, 1980; 23: 412-414.